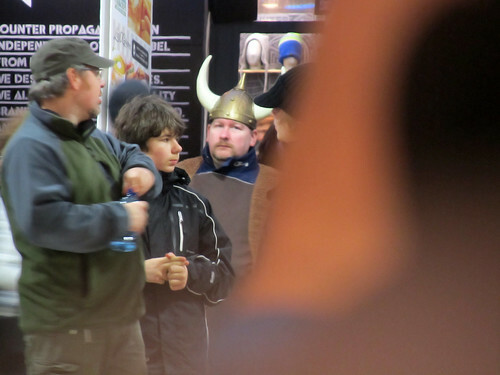 Ah marketing gimmicks of today – presenting: a modern Viking! I was vaguely curious when I first saw a man in a huge drape-like cloth over him. “Was he wearing a snuggie?” Apparently not. It wasn’t exactly a doublet, nor a gambeson, so I reckon it to be a bliaut. Mind, I’m not exactly conversant in historical clothing items. He then proceeded to put on a gilet, and out came the Viking hat. Alllllllriiiiiightio. His job was to stand outside (in the cold) with a sign panel, an advertising strategy that seems to be very popular in Dublin since the last couple of years. Not an easy job by any mean, especially in winter (you try standing out there for a couple of hours – even 12°C would seem like 3-4°C), so hat tip to these sign holders. I tried to then papparazzi-shot him but as you can see, I think I’ve been busted. no job is easy anymore nowadays, unless you’re paris hilton?